The Bangladesh Army or Shena Bahini is the land troops of the Military of Bangladesh. 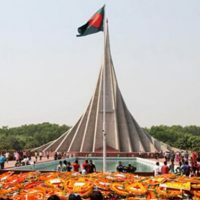 Army was formed on April 15, 1971 following the oath of the Bangladesh Government at Meherpur of Kushtia during Independence War of Bangladesh. In the beginning Bangladesh Army consisting of Bengali soldiers and Officer who left from the Pakistan Army. 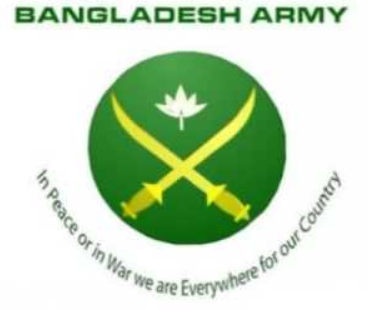 Bangladesh Army and Other forces are responsible to save Bangladesh resources by taking direct control over paramilitary, police, public transportation and other defense industries. 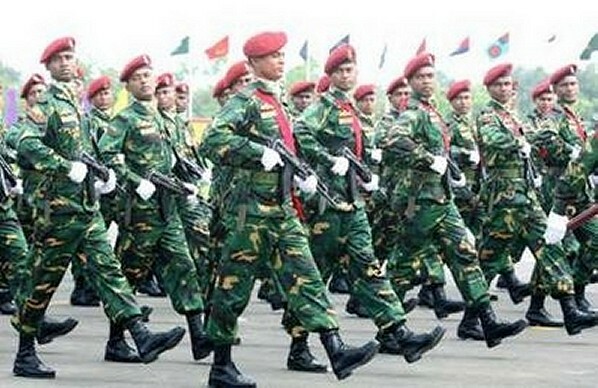 Bangladesh Army is constitutionally obligated to help the political government during times of crisis. Contibution to UN Peacekeeping mission. 1st) Major General K M Shaifulla, Bir Uttam (from 12 April 1972 to 24 August 1975). 2nd) Major General Ziaur Rahman, Bir Uttom ( from 24 August 1975 to 3 November 1975). 3rd) Major General Khaled Mosharraf (from 3 November 1975 to 7 November 1975). 4th) Lieutenant General Ziaur Rahman, Bir Uttom , 7th president of Bangladesh (from 7 November 1975 to Feb 1979 ). 5th) Lieutenant General Hussain Mohammad Ershad , 10th president of Bangladesh (from Feb 1979 to Aug 1986). 6th) Lieutenant General Atiqur Rahman (from 1 September 1986 To August 1990). 7th) Lieutenant General Nuruddin Khan (from November 1990 To June 1994). 9th) Lieutenant General Muhammad Mahbubur Rahman (from May 1996 To December 1997 ). 10th ) General Mustafizur Rahman, Bir Protik (from24 December 1997 To 23 December 2000 ). 11th ) Lieutenant General M Harun-Ar-Rashid (from 24 December 2000 To 16 June 2002 ). 12th) Lieutenant General Hasan Mashhud Chowdhury, awc, psc (from 6 June 2002 To 15 June 2005 ). 13th) General Moeen U Ahmed, ndc, psc (from 15 June 2005 To 15 June 2009). 14th) General Md Abdul Mubeen, ndc, psc (from 15 June 2009 To 25 June 2012 ). 15th) General Iqbal Karim Bhuiyan, psc (from 25 June 2012 To present ). Army Cantonment Location across the Country. 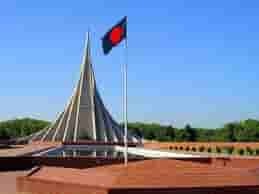 DHAKA: Dhaka Cantonment, Mirpur Cantonment, Postogola Cantonment, Savar Cantonment. BOGRA: Bogra Cantonment, Jahangirabad Cantonment. Bangladesh Army Work in following country or territory under UN Mission. United Nations Mission in Darfur. United Nations Mission in Western Sahara. United Nations Mission in Sudan. United Nations Mission in Ivory Cost. United Nations Mission in Liberia. United Nations Mission in Timor Leste. United Nations Mission in Car & Chad. United Nations Mission in West Africa. United Nations Mission in Somalia. Unmarried Bangladesh citizen can Joint Bangladesh Army. Age: 17 years – 21 years. SSC or HSC passed with GPA 5 for BMA and 3.5 for DSSC & BMA special. Male : Height – 5 feet 4 inches, Weight: 45.36KG, Chest: 30 Inch normal and 32 inch extended. Female: Height – 5 feet 1 inches, Weight: 40.82KG, Chest: 28 Inch normal and 30 inch extended. Army Medical Corps, Army Dental Corps, Army Education Corps – the Judge Advocate General’s Branch, Corps of Engineers, Electrical and Mechanical Engineering Corps and Army Signal Corps. Trade1- Education: SSC/Equivalent : GPA 2. Trade2 – Education: SSC/Equivalent : GPA 1. 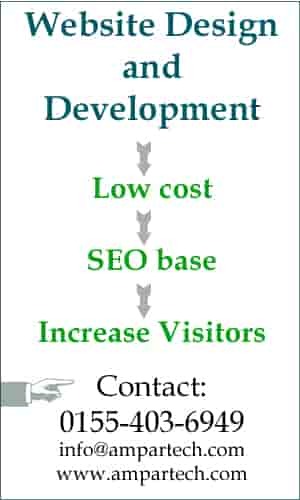 Age : 17 – 20 years. Trade 1 : Education: SSC (Vocational): GPA 2. Trade 2: Education: SSC (Vocational) : GPA 1. Clerk Trade: SSC GPA 2, Having Computer Knowledge. Driver: SSC GPA 2, Having Driving License. Chest: 30 Inches Normal, 32 Inches extended.